Let’s see how changing one dimension changes the volume of a shape. At the end of the trip, how far did the truck drive, and how much gas did it use? 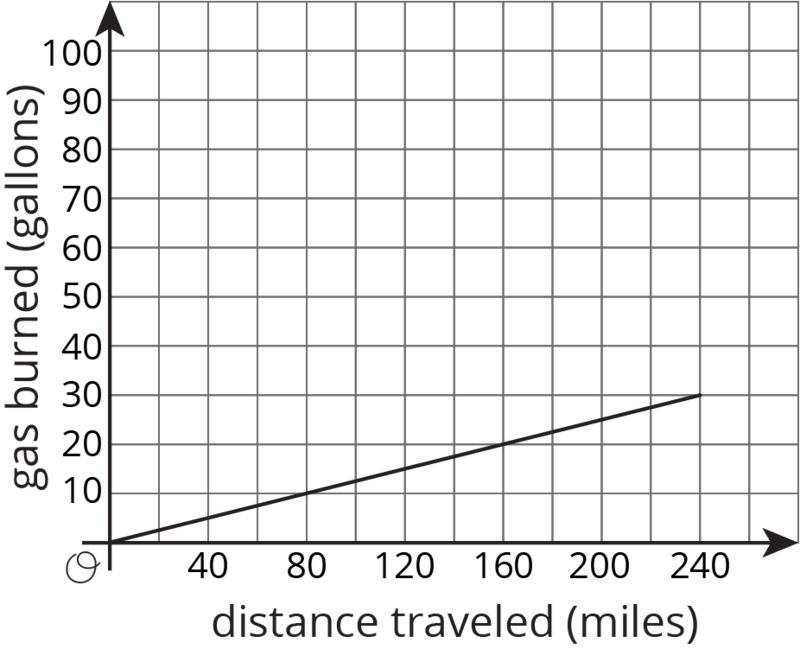 If a truck traveled half this distance at the same rate, how much gas would it use? If a truck traveled double this distance at the same rate, how much gas would it use? Complete the sentence: ___________ is a function of _____________. There are many right rectangular prisms with one side of length 5 units and another side of length 3 units. Let $s$ represent the length of the third side and $V$ represent the volume of these prisms. Write an equation that represents the relationship between $V$ and $s$. What happens to the volume if you double the side length $s$? Where do you see this in the graph? Where do you see it algebraically? There are many cylinders with radius 5 units. Let $h$ represent the height and $V$ represent the volume of these cylinders. Write an equation that represents the relationship between $V$ and $h$. Use 3.14 as an approximation of $\pi$. What happens to the volume if you halve the height, $h$? Where can you see this in the graph? How can you see it algebraically? Suppose we have a rectangular prism with dimensions 2 units by 3 units by 6 units, and we would like to make a rectangular prism of volume 216 cubic units by stretching one of the three dimensions. What are the three ways of doing this? Of these, which gives the prism with the smallest surface area? Repeat this process for a starting rectangular prism with dimensions 2 units by 6 units by 6 units. Can you give some general tips to someone who wants to make a box with a certain volume, but wants to save cost on material by having as small a surface area as possible? What do the coordinates of the labeled point represent? 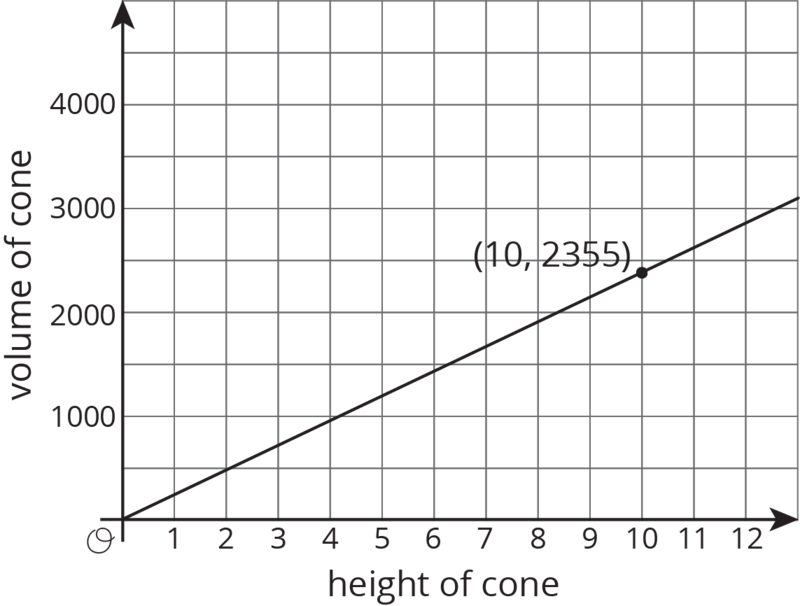 What is the volume of the cone with height 5? With height 30? Use the labeled point to find the radius of these cones. Use 3.14 as an approximation for $\pi$. Write an equation that relates the volume $V$ and height $h$. Imagine a cylinder with a radius of 5 cm that is being filled with water. 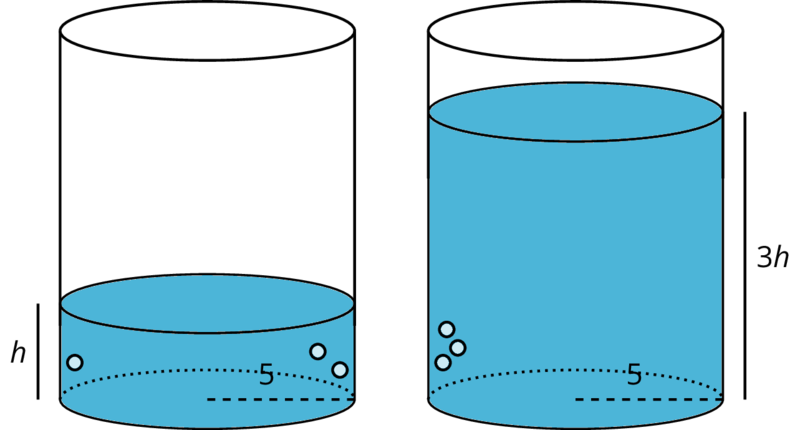 As the height of the water increases, the volume of water increases. This equation represents a proportional relationship between the height and the volume. We can use this equation to understand how the volume changes when the height is tripled. The new volume would be $V = 25 \pi (3h) = 75 \pi h$, which is precisely 3 times as much as the old volume of $25\pi h$. In general, when one quantity in a proportional relationship changes by a given factor, the other quantity changes by the same factor. Remember that proportional relationships are examples of linear relationships, which can also be thought of as functions. So in this example $V$, the volume of water in the cylinder, is a function of the height $h$ of the water.